In what has already become a well-founded tradition, the Kadar Family Award for Outstanding Research was presented for the third year running at the Second Assembly of the International Board of Governors Meeting, moderated by Chairman of the Board Prof. Jacob A. Frenkel. 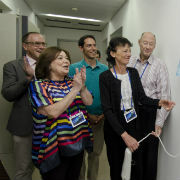 The Kadar Family Award was created by a donation from the Naomi Foundation, which honors the memory of Naomi Prawer Kadar, PhD, a lifelong educator and specialist in Yiddish children’s literature, and the late wife of TAU benefactor Dr. Avraham Kadar. Dr. Avraham Kadar, a physician, educator, and innovator, was a graduate of TAU’s Sackler School of Medicine. Their children, Maya, Nadav, and Einat, are active board members of the Naomi Foundation; Maya and Nadav are also TAU alumni and Einat is currently a student at TAU's Sackler School of Medicine. TAU President Joseph Klafter said: “The Kadar family is actively committed to TAU, supporting numerous initiatives across campus, from a Yiddish summer program, to a fund for encouraging women to undertake MBA studies. The University gained a strong friendship and I myself gained a true friend." Ms. Ilana Kurizki, the Naomi Foundation's Advisor to the Board and Ambassador in Israel said: "When the Kadar family envisioned this award it emphasized that recipients must be not only pioneers in research, but also true educators. This is why we’ve asked today's recipients to give TED-style presentations, which are based on a powerful message that leaves listeners with something to think and reflect on. This is what a good teacher is all about, and this is what we focus on as a foundation - the power of teaching." Also present at the ceremony were several members of the extended Kadar family. Acknowledging excellence in research and education, the award is divided into two categories — the sciences and the humanities — with prizes for senior and junior researchers in each category. Recipients are evaluated based on their contributions to their field of specialization and society and their academic prominence. 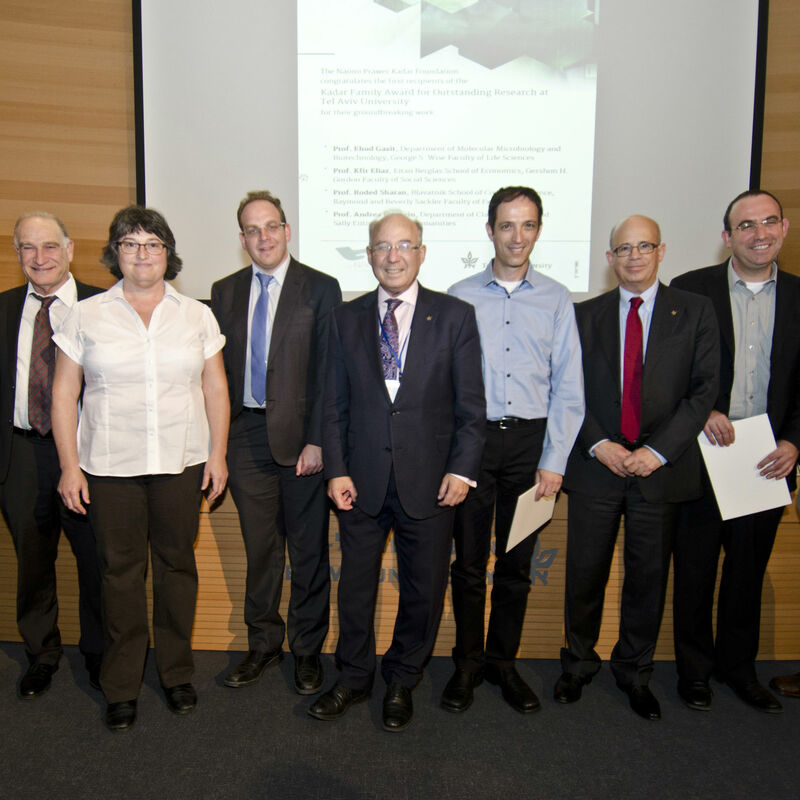 TAU Vice President for Research and Development, Prof. Yoav Henis, introduced this year's recipients: Prof. Ron Shamir of the Raymond and Beverly Sackler Faculty of Exact Sciences, for his outstanding research in the field of bioinformatics and computational biology, Prof. Nira Liberman of the Gershon H. Gordon Faculty of Social Sciences, for her exceptional work in social psychology, Prof. Oded Hod of the Raymond and Beverly Sackler Faculty of Exact Sciences, for his contribution to research on nanoscale materials and application of computational methods; and Prof. Roy Mukamel, of the Gershon H. Gordon Faculty of Social Sciences and Sagol School of Neuroscience, for his remarkable work in the field of enveloping ways to understand neural activity in motor pathways (fMRI). Among the Kadar family's other initiatives at TAU are the Naomi Prawer Kadar International Yiddish Summer Program, the TAU Global Research & Training and the Kadar Scholarships for Women in Business and Entrepreneurship.